The radicular cyst variously known as periapical, apical periodontal, dentoalveolar or root-end cyst is an inflammatory jaw cyst at the apices of teeth with infected and necrotic pulps. A radicular cyst arises from the epithelial residues in the periodontal ligament as a result of inflammation, usually following death of the pulp. Radicular cysts are the most common odontogenic cystic lesions of inflammatory origin and are managed either by surgical enucleation or by marsupialization. We illustrate the possibility of complete healing of a cystic periapical lesion of huge proportion in permanent dentition of a 58 year-old male patient under general anesthesia with conservation of vital structures and without using any bone substitute. Nair PN. Review New perspectives on radicular cysts: Do they heal? Int Endod J. 1998;31:155–160. Shear M. Cysts of the Oral Regions. 3rd ed. Wright. Oxford, 1992:137-62. Rees JS. Conservative management of a large maxillary cyst. Int Endod J. 1997;30:64–67. Walton RE. The residual radicular cyst: Does it exist? Oral Surg Oral Med Oral Pathol Oral Radiol Endod. 1996;82:471. Yilmaz HG, Bayindir H. Lateral periodontal kist görünümlü radiküler kistin ve eksternal kök rezorpsiyonunun cerrahi ve endodontik tedavisi. Cumhuriyet Dent J 2012;15:48-54. Delantoni A, Papademitriou P. An unusually large asymptomatic periapical lesion that presented as a random finding on a panoramic radiograph. Oral Surg Oral Med Oral Pathol Oral Radiol Endod. 2007: 104; e62- e65. Gibson GM, Pandolfi PJ, Luzader JO. Case report: a large radicular cyst involving the entire maxillary sinus. Gen Dent. 2002:50; 80-81. Regezi JA, Scıubba JJ, Jordan RCK. Oral Pathology Clinical Pathologic Correlations. 4th ed. Saunders. St. Louis Missouri, 2003:241-244. Chiapasco M, Rossi A, Motta JJ, Crescentini M. Spontaneous bone regeneration after enucleation of large mandibular cysts: A radiographic computed analysis of 27 consecutive cases. J Oral Maxillofac Surg. 2000;58:942. Ihan Hren N, Miljavec M: Spontaneous bone healing of the large bone defects in the mandible. Int J Oral Maxillofac Surg. 2008;37:1111-1116. Iatrou I, Theologie-Lygidakis N, Leventis M. Intraosseous cystic lesions of the jaws in children: a retrospective analysis of 47 consecutive cases. Oral Surg Oral Med Oral Pathol Oral Radiol Endod. 2009;107:485-492. Pappalardo S, Coronella M, Lanza ML, Rabbito V, Foti PV, Mauro LA, Palmucci S, Ettorre GC. Multidetector CT Dentascan evaluation of bone regeneration obtained with deproteinised bovine graft in residual cavity after mandibular cyst enucleation. Radiol Med. 2013;118:523-533. 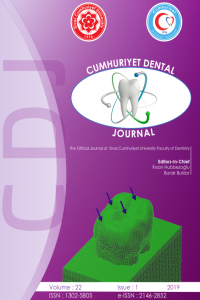 Misir AF, Türer A, Bulut E, Sümer M, Karagöz F. Rehabilitation of benign pathological condition by dental implants. JDI. 2012;2:127-130. Karamanis S, Kitharas T, Tsoukalas D, Parissis N. Implant placement after marsupialization of a dentigerous cyst. J Oral Implantology 2006;32:313-316. Cakarer S, Selvi F, Isler SC, Keskin C. Decompression, enucleation, and implant placement in the management of a large dentigerous cyst. J Craniofac Surg. 2011;22:922-924.